President Obama inherited two controversial counterterrorism program’s from the Bush administration: a harsh interrogation program and the use of drones to kill terrorism suspects outside of traditional battlefields. Upon assuming office, the President repudiated the interrogation standards that had been authorized by his predecessor and emphasized U.S. compliance with international human rights obligations and the anti-torture norm. By contrast, President Obama authorized a marked expansion of the CIA and Pentagon's use of drones for surveillance and targeting. 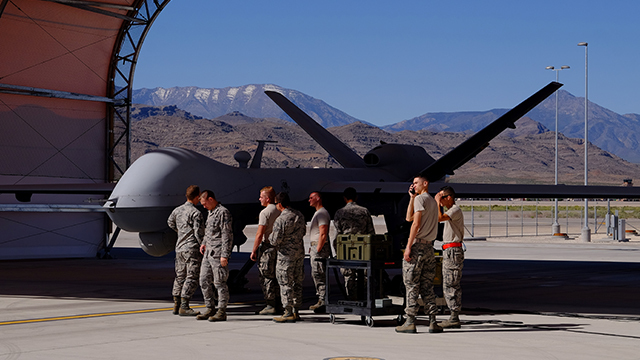 Some have argued that the expansion of the drone strikes will be one of the enduring foreign policy and national security legacies of the Obama administration. This half-day conference will interrogate that assessment as we approach the 2016 elections and enter the final weeks of the Obama presidency. The conference will include two panels, the first considering the administration’s drones policy from a national security perspective and the second evaluating the government’s drones program from the perspective of international humanitarian law. GEN. WESLEY K. CLARK is a businessman, educator, writer and commentator. General Welsey K. Clark serves as Chairman and CEO of Wesley K. Clark & Associates, a strategic consulting firm; Board Member of Growth Energy; senior fellow at UCLA's Burkle Center for International Relations; Advisor at the Blackstone Group; Trustee of International Crisis Group; Founding Chair of City Year Little Rock/North Little Rock; Chairman of Enverra Inc., a banking and strategic advisory firm; Chairman of Energy Security Partners, LLC; as well as numerous corporate boards including Amaya Gaming, Bankers Petroleum, BNK Petroleum, and Rentech. A best-selling author, General Clark has written four books and is a founding member of the Clinton Global Initiative, and Director of the Atlantic Council. Clark retired as a four star general after 38 years in the United States Army. He graduated first in his class at West Point and completed degrees in Philosophy, Politics and Economics at Oxford University (B.A. and M.A.) as a Rhodes Scholar. General Clark has passed Series 24, 62, 63, 79, and 99 of the FINRA Examination. While serving in Vietnam, he commanded an infantry company in combat, where he was severely wounded and evacuated home on a stretcher. He later commanded at the battalion, brigade and division level, and served in a number of significant staff positions, including service as the Director Strategic Plans and Policy (J-5). In his last assignment as Supreme Allied Commander Europe he led NATO forces to victory in Operation Allied Force, saving 1.5 million Albanians from ethnic cleansing. His awards include the Presidential Medal of Freedom, Defense Distinguished Service Medal (five awards), Silver star, bronze star, purple heart, honorary knighthoods from the British and Dutch governments, and numerous other awards from other governments, including award of Commander of the Legion of Honor (France). CONOR FRIEDERSDORF is a staff writer at The Atlantic, a contributor to the Los Angeles Times, and founding editor of The Best of Journalism, a newsletter dedicated to exceptional nonfiction. KATE MARTIN is a Senior Fellow at American Progress where she works on issues at the intersection of national security, civil liberties, and human rights. The New York Times’ Taking Note blog described her as “an expert on surveillance and detention, and a leading advocate for the rule of law in the so-called ‘war on terror.’” Before coming to American Progress, Martin served as director of the Center for National Security Studies for more than 20 years. She frequently testifies before Congress on national security and civil liberties issues. She is also a frequent commentator in the national media and has written extensively on these issues for the past 25 years. At the Center for National Security Studies, Martin brought lawsuits that challenged government deprivations of civil liberties. She has taught national security law and served as general counsel to the National Security Archive. Before joining the public interest world, she served as a partner at the law firm of Nussbaum, Owen & Webster.